In 1810, a French Huguenot emigre named Jean Jaques purchased land in New York's bucolic Hudson Valley and began planting grapes. By 1837, Mr. Jaques needed more land, so he purchased a plot in the quiet village of Washingtonville, NY, and planted another vineyard. By 1839, his first underground cellars were dug and Mr. Jaques fermented his first wine vintage. Those cellars, the oldest and largest in America, are still in use today at Brotherhood Winery. This is the oldest winery in the United States. The Jaques family made wine at the Washingtonville facility for almost 60 years, selling much of it to Jesse and Edward Emerson, two New York City wine merchants. The Emersons, Finger Lakes vinters themselves, understood the high quality of Mr. Jaques' wine and used it to improve a blend of wine from an organization called The Brotherhood of New Life - an experiment in utopian communal living in the Hudson Valley. 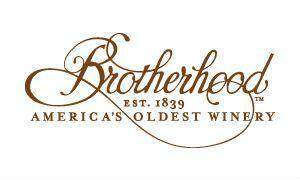 When the Emerson family took control of the Washingtonville winery, they renamed it Brotherhood, a name that it still proudly bears today. The Emerson family operated Brotherhood until Prohibition. In 1921, Louis Farrell purchased the winery and its large stock of sacramental wine. He sold wine for religious ceremonies throughout Prohibition, which was finally repealed in 1933. It has been noted that the clergy population in the area grew substantially during this period. Louis and his wife were the first to grasp the value of Brotherhood's location, as the nearest winery to New York City. They began conducting tours of the winery, highlighting the now-enlarged underground cellars, the history of the facility and its picturesque site. In fact, the Farrell family initiated the very concept of wine tourism, hosting parties and events at the winery that drew hundreds of thousands of fans annually, and introduced the Brotherhood brand to generations of American drinkers. "This ruby red wine is dry and full-bodied, yet soft on the palate. Barrel-aged for at least 6 months, it has complex aromas and flavors of sweet cherries and berries." "Aged in limousin oak barrels for over 2 years. Complex, full-bodied, excellent for aging."